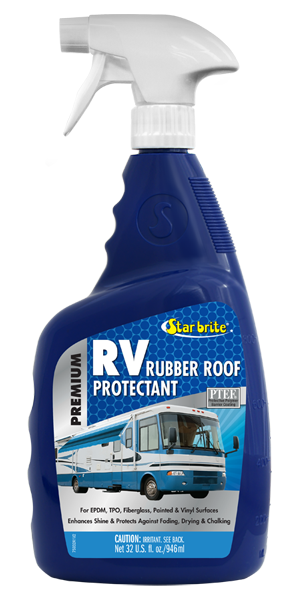 Star brite Premium RV Rubber Roof Protectant is engineered to provide an easy way to add a protective barrier against stains and the drying effects of UV exposure. The formula can be used on any roof material as often as desired. Apply to surfaces that are cool to the touch and clean. We recommend Star brite Premium RV Rubber Roof Cleaner. Spray Rubber Roof Protectant onto surface to be treated, making sure to overlap the spray pattern to ensure uniform coverage. Wipe up any overspray or drips from surfaces not being treated. For best results, apply on a monthly basis or more often if roof is exposed to severe weather.